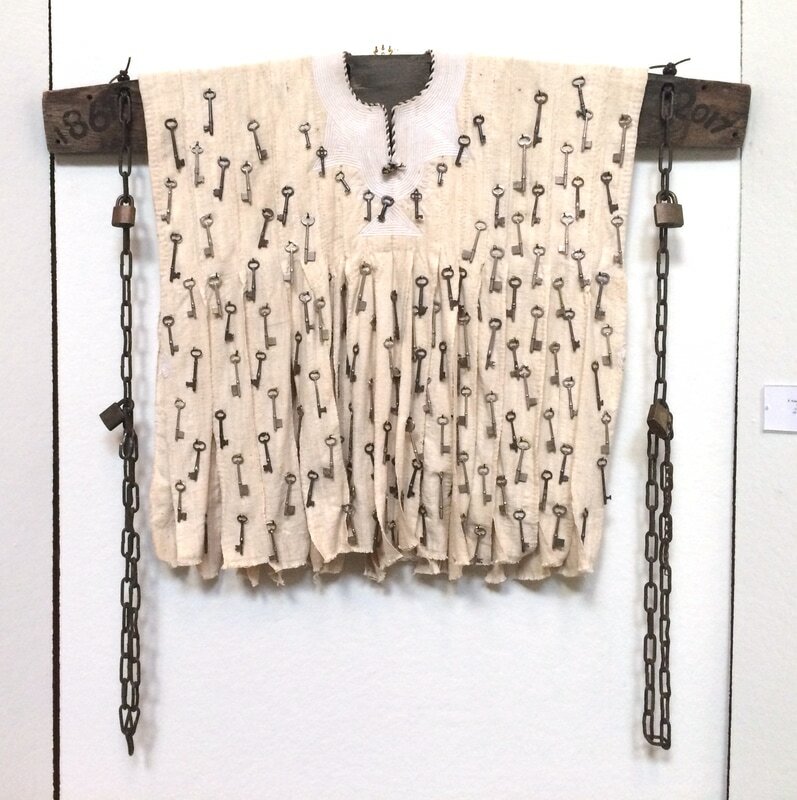 Deconstructed Cotton Garment known as “Fugu” (Foo-Goo): Also known as an African “smock”; this hand woven cotton garment from Ghana, connects Africa to America. Ghana, a nation on the west coast of Africa devastated by the slave trade. Incidentally, cotton was a primary crop associated with slave labor. Inscriptions on Locks - American Symbolisms: US, American, Eagle, MADE IN U.S.A.
Oak Wood: Strength, Endurance, Wisdom. One of many woods used to construct slave ships as well as early schools and school furniture. The oak board was part of a southern courthouse record room table used to hold record books, which held recordings of property documents, including chattel slave records. These symbols and symbolisms are only a few of the many incorporated in this artwork. The viewer may find additional or different meanings based upon their history and individual experiences they bring to this work of art.